I sure do love a good rummage sale. I get to scratch my consumer itch. While rescuing items from threat of ending up in a landfill. Digging through other people’s discards feels like a treasure hunt to me. My boy & I went treasure hunting at a local church rummage sale last weekend. We had a great time perusing every last bit of junk. We speculated over the use of random kitchen accoutrements. Searched for vintage board games. Looked through every available book. We both came home with some great finds. My big score of the day were three vases. I’m still so tickled over the deal I got for these. I have share about it with you! 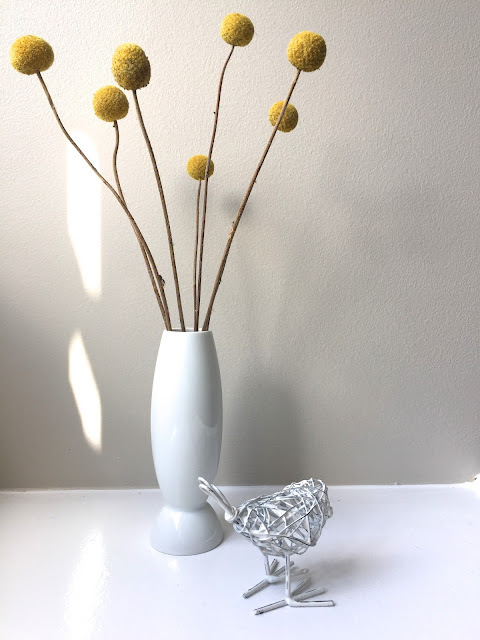 A William Sonoma glass bud vase. You know William Sonoma prices can be dear, yes? But church rummage sale prices are not. I paid 50 cents for it. 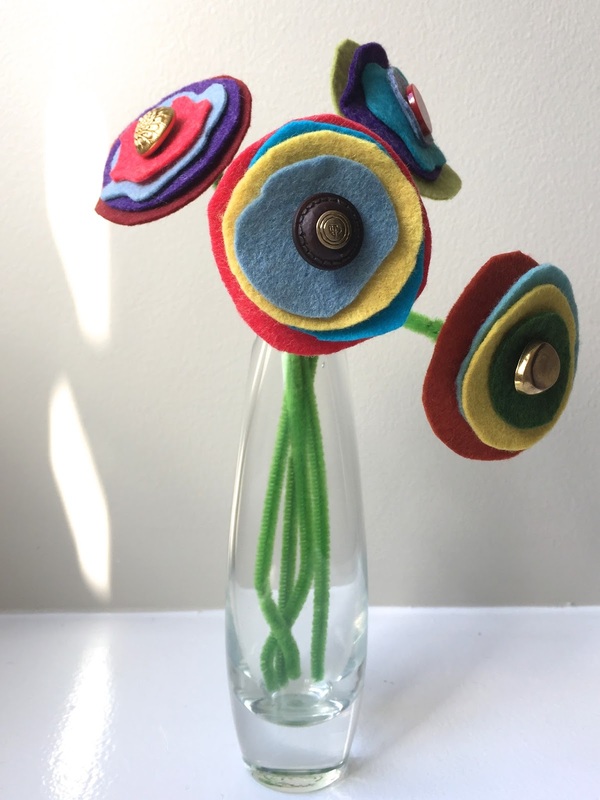 It’s a perfect vase to display some of those felt flowers we made this week. when we walked into the building. Loved the feel of it. A fellow treasure hunter shared some details about this piece. There’s a signature carved across the bottom. this hand carved piece might sell for $150. I think it is a nifty piece. And my favorite find of the day. Wrapped packages under the Christmas tree. Kiddies happily shaking shiny boxes bedecked in ribbons. Excitedly anticipating the glut of holiday loot. Our wrapping traditions are horribly wasteful. Designed and produced for one time use. Then mostly swept into trash bags & left curbside. One small way to make a difference is to rethink the wrapping thing. My preferred wrapping alternative is to use furoshiki. Think fabric instead of paper. Tying knots instead of taping. Ironing and reusing the next (and the next and the next). Here’s my post on how I make and use my furoshiki. 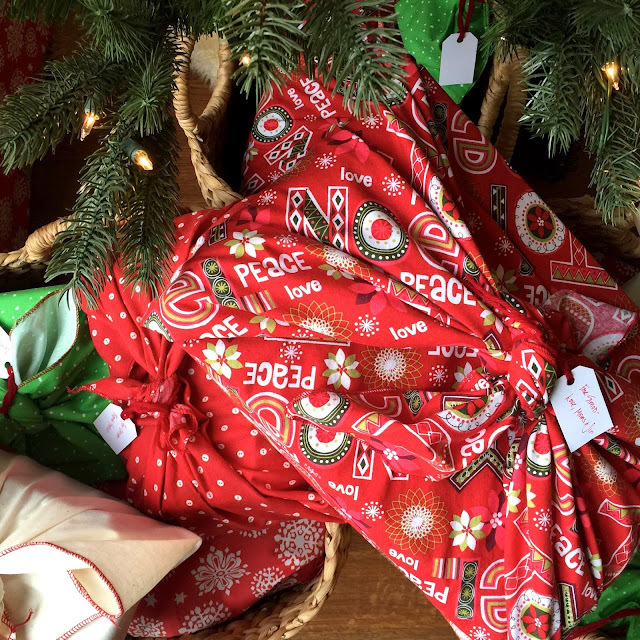 In the short term, wrapping with fabric is not a cheaper option. It also takes some time to cut and finish the fabric edges. But the results are pretty, functional, reusable and creates no waste. Which in my book, makes it worth the extra effort. New wearables to replace the ones they’ve worn out or outgrown. Socks, pajamas, hats, gloves, etc. I fill a single basket for each boy. And cover with a square of fabric. There is no gleeful tearing or ripping of paper at our house Christmas morning. But there are still twinkly lights. 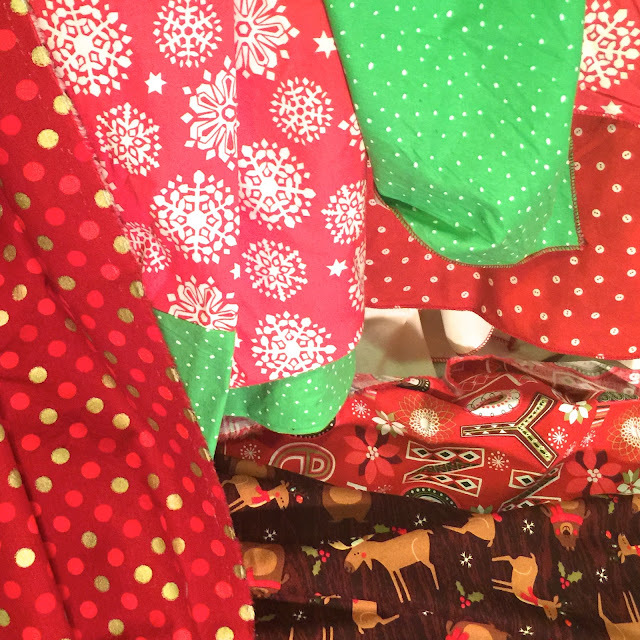 Colorful wrapped gifts under the Christmas tree. And a little less waste. Here’s a peak into the studio of artist Steven Wine of ABYU Lighting. Steven made the nifty upcycled lamp, Schnappi, I shared with you a few weeks ago. When I told him how much I admired his work, he invited me to his studio to see some of his other creations. You know I was super excited to go! ..entered his delightfully inspired workspace. Just walking into his studio put a big smile on my face. High ceilings. White walls. Cement floors. Various sitting areas and work stations set up throughout the space. 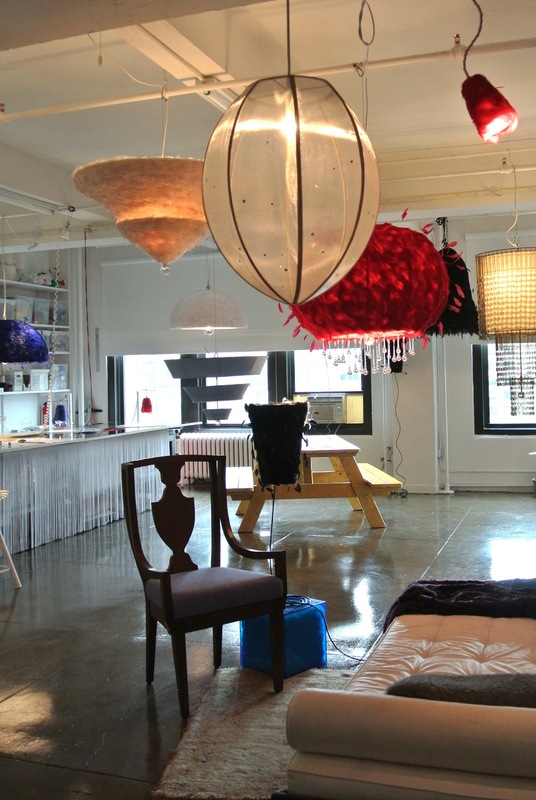 And everywhere, Steven’s amazing collection of lighting fixtures. 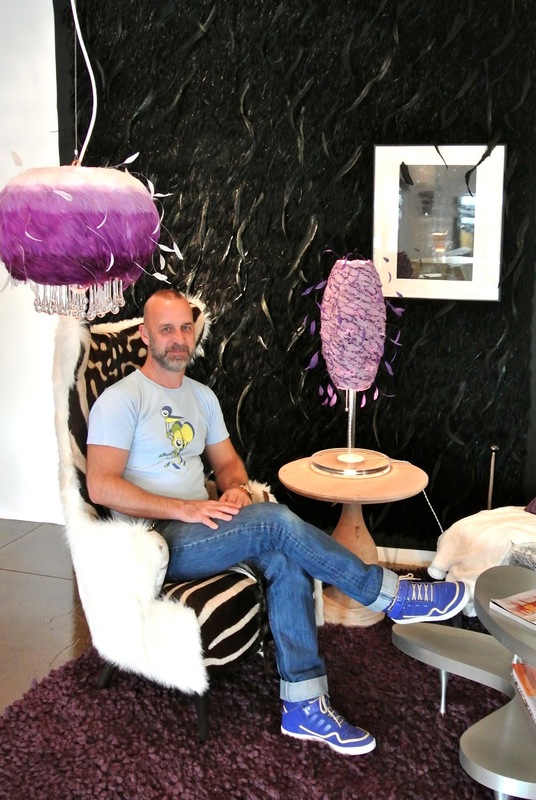 As you can see from the pictures above, much of Steven’s work features feathers. This was something I’ve never seen before. I was struck by how rich a feeling the feathers evoked. The feathered lights were impressive. But my favorite piece was this hanging light made from reflectors. I want this. And then, there was Steven’s series of upcycled lamps – Schnappi & all his friends! 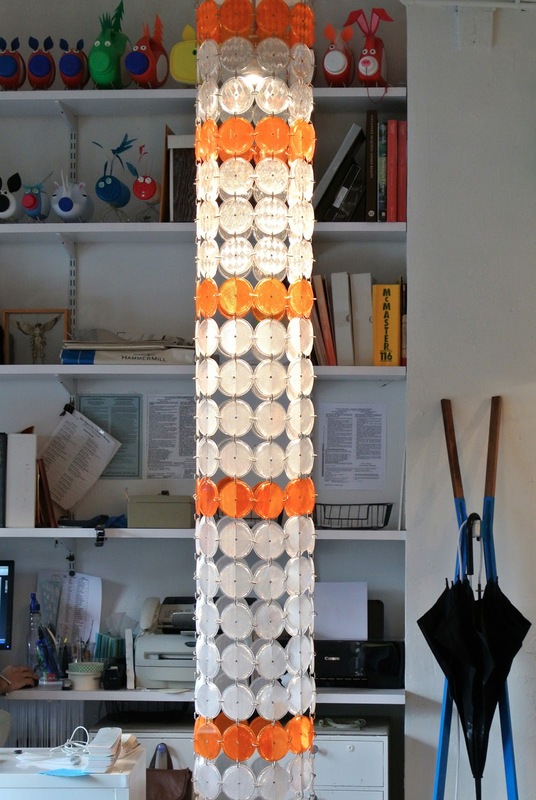 The bodies for these lamps were made from discarded detergent bottles and various other plastic containers. Where most folks would just see trash, Steven saw ducks, pigs, cats, anteaters, alligators, bugs and more. If you look closely, you’ll notice that each “guy” even has his own personality. I really enjoyed my visit to ABYU Lighting (thank you, Steven!). 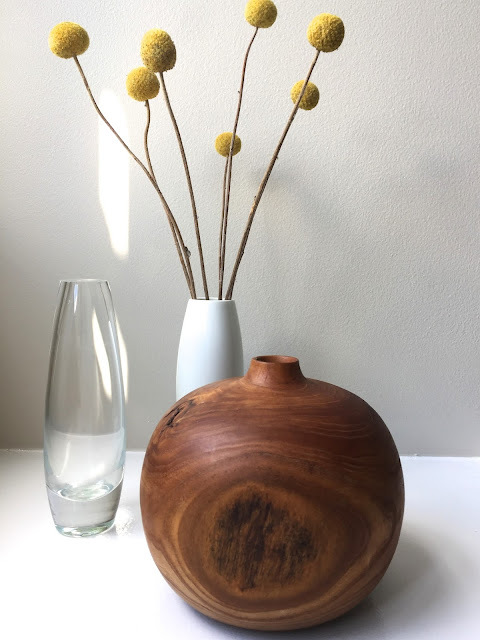 I think Steven’s work is beautiful. If you continue visiting my blog, count on seeing more from Steven in the future! My boys just outgrew another round of t-shirts. Thought these were too cute to convert to t-shirt yarn, so I made them into bags instead. All you need is a t-shirt, a pair of scissors, tailor’s chalk, something round to trace around (I used a pot lid), access to a sewing machine and about 15 minutes. Here’s the link to the tutorial I referred to. Be sure to follow the instructions about leaving the seams on when you are cutting the sleeves off (otherwise your bag handles will end up flimsy and weak). I used a stretch stitch (on my regular sewing machine) along the bottom of the t-shirt first. Then switched to my serger to trim the bottom hem off the t-shirt and to put a clean finish on it. Super simple. Super fast. Just cut, cut, cut and then sew across the bottom and voila! New tote. So why are you still on this page? Go make one of these already! What to do with all those unwanted t-shirts? Both the well-loved worn out ones and the bright colored stiff ones we bring home from events and then never wear? One option would be to send them all off for textile recycling. 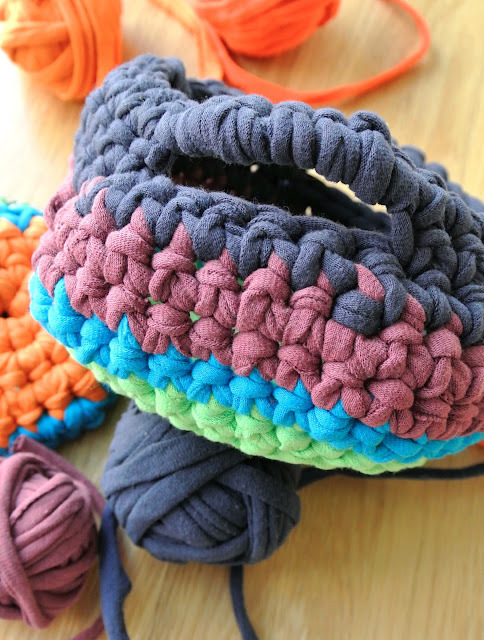 While I do use this option frequently, I have also been exploring how I might salvage and reuse castoffs in my sewing, knitting and crocheting. It was with this goal in mind that I set about chopping up a big pile of cast off t-shirts into t-shirt yarn. I set up shop on my dining table. Thirty-plus t-shirts, a big cutting mat, a rotary cutter, a sharp pair of fabric scissors… and lots and lots of patience. Took a while, but when the dust & the fiber-bits settled, I had thirty balls of t-shirt yarn to crochet with and a pile of fabric scraps & goof-ups to send to textile recycling. A bath mat. I used all the scruffy worn out “white” undershirts (ok, some not so white anymore) and a US L (8 mm) crochet hook to make this mat. Chained 50, then just single crocheted back and forth to form a rectangle approximately 25 inches by 22 inches. I was trying to make a perfect square… alas, I ran out of white t-shirt yarn. Since these t-shirts had been well worn, they were all different shades of “white.” Some “pinkish-white,” some “greyish white,” and a few “white-white.” No matter. I used them all. The result was a surprisingly clean look. I was also very pleased with the thick springy texture of the mat; very comfortable to step on with bare feet. My only issue with the mat was the slight old t-shirt smell to it. I’d washed all shirts before cutting, but some of them were still a little… well… smelly. Luckily, a final time through the washing machine with some bleach took care of it. Of course, I just had to make another basket. I used the new, unworn, super stiff t-shirts for this project. The stiffness of the t-shirts made for a very sturdy basket (and a very sore wrist from manipulating the hook through the “yarn”). 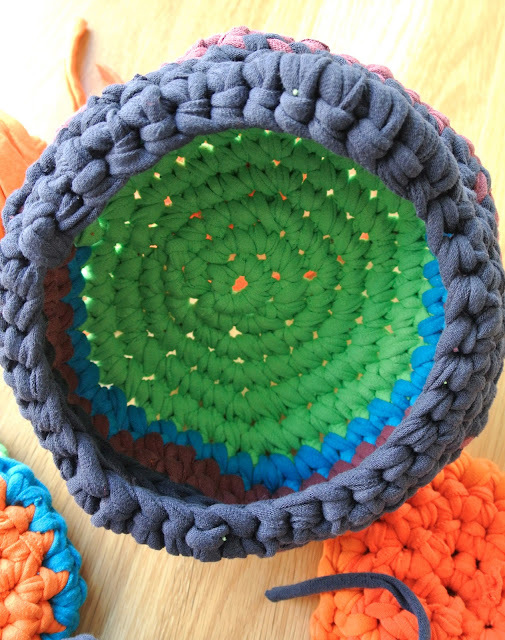 I would have loved to make the basket bigger, but I wanted a particular color pattern. Hence, size was limited by available t-shirt colors. I used the last of my bright scraps to crochet a few coasters. Super thick and absorbent. Not a coaster to put under a delicate wine glass, but it’d work for a big ol’ heavy mug of something. Next time I get my hands on bright t-shirts, I may build on these to turn them into trivets instead. And there you have it. Three ways one might get a little more use out a pile of t-shirts no one wants to wear anymore. I have a few more ideas in mind, but before I can do that, it’s back to collecting t-shirts. Got any you could pass my way?